Associates the Ruscus extract enriched in saponins (cutaneous microcirculation promoter) with dextran sulfate (decongestant), in a Relief concentrate for chronic redness. Specially suitable for all types of sensitive skin prone to redness. Reduces redness and skin apparent small vessels. Clean skin with Antirougeurs redness-relief dermo-cleasing milk and then apply the product in the affected areas (cheekbones, wings of the nose). The redness, rosacea or couperose is a skin condition characterized by diffuse redness, specially in the face. It is more common in fair, thin and sensitive skin, affecting men and women equally. Fine face vessels tend to react and dilate to external stimulus and aggressions, appearing the unsightly redness. 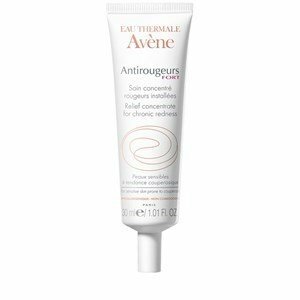 Antirougeurs Avéne line normalizes dermal blood microcirculation, calming the sensation of irritation and skin heating.